Showcasing the best of the Madison Region’s people, places and positive business climate, the Madison Region Economic Development Guide reinforces the area’s favorable quality of place while also targeting prospective residents, employees, businesses and visitors. The publication will be distributed by the Madison Region Economic Partnership as well as through key local businesses, trade shows, conferences and events throughout the year. 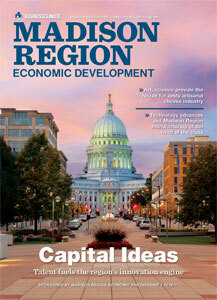 The Madison Region Economic Development website, businessclimate.com/madison-region will also feature fresh, new extended content, video, photo galleries and more. The annual publication is a collaborative effort between the Madison Region Economic Partnership and Journal Communications, an award-winning custom publisher of community and specialty magazines with clients in more than 30 states. For more information on becoming a part of the Madison Region Economic Development Guide, email sales@jnlcom.com or call (800) 333-8842 Ext. 292. The publication will publish in Spring 2017.